Nuttier’n a fruitcake: (Also “nutty as a fruitcake” or “he/she’s a fruitcake”) Crackbrained or crazy. Not just Southern, the expression originated in England, like many of our favorite regional idioms. Being “nutty” was first recorded between 1821 and 1846 to refer to insanity: The “nut” was Anglo slang for a person’s head or brain. It later also came to refer to a poor grade of heating coal known as nutty slack that would burn slowly and with erratic explosions. The fruitcake reference was first recorded in America in the early 20th century. NOTE: We Southerners LOVE our fruitcakes of all sorts, especially if they’re kin. The Old Bride is going nutty this season, in more ways than one. And why not? We Southerners put nuts in many of our favorite holiday dishes … from our holiday cheese logs to our casseroles, not to mention our numerous types of cakes. That’s why I thought we ought to focus this week on pecans —every Southerner’s favorite nut. Pecans are nutritious raw or cooked. The part of the pecan that we eat is not truly a nut, but rather, the seeds (sometimes called the meat) in the drupe. For those of us who skipped botany class: The drupe is a fruit with a single stone or pit, surrounded by a husk. The husks are produced from the exocarp tissue of the tree flower, and the part known as the nut develops from the endocarp, and contains the seed. The husk starts out green and turns brown at maturity, splitting into four sections to release the thin-shelled brown nut containing the seed. Pecan seeds provide a good source of protein and unsaturated fats, as well as manganese. They contain omega-6 fatty acids, although the walnut contains about twice as much of this beneficial component. Regular consumption of pecans can lower the risk of gallstones in women, and the pecan antioxidants and plant sterols have been found to reduce high cholesterol by lowering the LDL (“bad cholesterol”). Daily consumption of pecans might delay age-related muscle nerve degeneration as well. The name “pecan” is derived from an Algonquin word meaning a nut requiring a stone to crack. The pecan tree is a species of hickory native to south-central North America, flourishing from Texas up the Mississippi Valley all the way north to Indiana and Illinois, and as far east as Georgia, and as far south in Mexico from Coahuila to Jalisco and Veracruz. They were an important part of the native Americans’ diets. 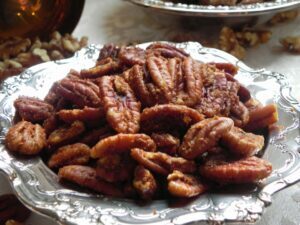 Wild pecans were well known among colonial Americans, but the crop was only domesticated as an agricultural crop in the 1880s. Led by Georgia, Texas, New Mexico and Oklahoma, pecans have become an important cash crop throughout the South, Kansas, Missouri, the Carolinas, Arizona, and even Hawaii. The U.S. produces 80-95% of the world’s pecans annually, with an annual crop of about 150,000 to 200,000 tons from more than 10 million trees. The crop also is grown now in Australia, Brazil, China, Israel, Mexico, Peru, and South Africa, in temperate zones where summers are hot and humid. Pecan trees may live for more than 300 years, although a nickel deficiency and a zinc deficiency can damage and even kill the trees. Modern pecan trees grown domestically are cultivars from clones derived from the wild trees. Two or more trees of different cultivars must be grown in proximity in order to pollinate each other, and most cultivars tend to bear few or no pecans every other year. Today, pecan festivals are held throughout the pecan-growing region of the United States, including throughout Georgia and Texas — and particularly in Groves, Texas, as well as Colfax, Louisiana, Whiteville, NC, and Hickman, KY. We Mississippians can take pride in being ahead of the field in our uses of pecans. No simple roasting and snacking for us— we’ve found a way to turn pecans into alcohol. The Lazy Magnolia Brewing Company in Kiln makes a popular craft beer from whole roasted pecans, called Southern Pecan Nut Brown Ale. Pecan Kugel is a Southern favorite, thought to have originated in east Texas and Mississippi where pecan trees flourish. It’s a flavorful substitute for candied sweet potatoes or corn pudding. This gorgeous dish is as tasty as it is attractive, and ought to become part of everyone’s repertoire, not just for Jewish holidays! Preheat oven to 350˚F. Place first butter in a 9-by-13-inch baking dish. Melt in the oven while oven is preheating. Remove and cool to lukewarm. Crumble the brown sugar evenly over the melted butter, pressing into the butter with a spoon. Arrange the pecan halves in rows on the sugar, rounded side down. 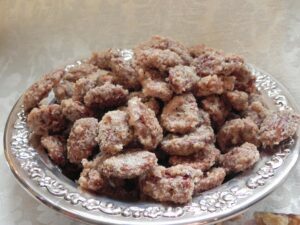 Use hands to lightly press the pecans into the sugar. Set aside. Cool the noodles in a large saucepan according to package instructions. Do not over-cook. Dump into a colander and drain well. Return the still-hot noodles to the saucepan and toss with the second butter until melted. Cover pot. Whisk together the sugar, salt and cinnamon in a small bowl. Combine the cottage cheese, sour cream or yogurt, eggs, vanilla, and sugar mixture until well blended. Add the buttered noodles, tossing gently. Pour noodle mixture over the pecan-sugar layer in the baking pan. Smooth the surface and cover with foil. Bake about 60 minutes, until kugel is firm and set (center doesn’t jiggle). Remove foil and bake about 10 minutes to brown the top. Transfer to a wire rack and cool about 10 more minutes. To unmold for serving, use a sharp knife or metal spatula to loosen the edges all around. Position a large rectangular platter or serving tray on top of the dish. Holding kugel dish and platter together, flip over and wait a moment until the nuts separate from the dish. Carefully lift the baking pan, making sure the entire kugel comes loose. The pecans should be revealed as a studded top in caramelized brown sugar. Serve hot or still warm, cutting with a serrated knife. Yields at least 16 servings. Preheat oven to 250˚ to 275˚F (depending on your oven). Line cookie sheet with parchment paper. Combine the salt and melted butter in a dish and add pecans. Toss until completely coated. Pour onto cookie sheet and spread out evenly. Bake approximately 45 minutes, or longer, tossing every 10 minutes until toasted. Taste one after 30 minutes; they are ready when crisp but not too dark. VARIATIONS: Add a pinch of cayenne pepper or chili powder or garlic powder to the salt before tossing. This was my family’s favorite pecan treat for the Christmas holidays. Aunt Rosie always made these from her stash of Pilot Club pecans. Stir butter and spices; mix with 4 c of pecans. Spread out in large flat pan and toast at 250ºF for 30 to 45 minutes. Stir occasionally while toasting. Use slotted spoon to spread on a paper towel to cool and drain. Store in tightly sealed metal container after completely cooled (several hours or overnight). Preheat oven to 350ºF. Mix butter and spices in a pan and remove from heat. Then add pecans and cover well. After a few minutes, recombine the pecans and spice mixture and spread the spiced pecans in one layer on a baking sheet. Roast for 15 minutes, tossing several times top keep from burning or roasting unevenly. Remove from oven and cool on a wire rack. Store in a tightly covered metal container. Heat oven to 300˚F. Line baking sheet with parchment paper and spray with nonstick cooking spray such as Pam. Beat egg white with the water until frothy but not stiff. Add pecans and stir until completely coated. Combine salt, sugar and cinnamon and add to the nuts. Toss well to coat. Pour mixture onto the baking sheet. Bake about 30 to 40 minutes, turning the nuts every 5 to 6 minutes. Remove from oven and stir once more before cooling on a rack. VARIATION: 1/3 c brown sugar, firmly packed and 3 T white sugar, reduce salt to 1/4 tsp, and cinnamon to 1/2 to 3/4 tsp.